The myria d of narrow ‘roads’ rising unevenly above the harbour provide a never ending source of exercise and entertainment for locals, visitors, their visitors and of course our dog, Kezzie. This morning she and I embarked upon the daily mystery tour, each pretending to the other that we had a precise grasp of our bearings. The paths, tracks, alleys were presumably designed to accommodate a donkey as this would have been the only way to transport heavy goods, before tiny Japanese three wheel trucks secured the contracts. On nearby Hydra, where no vehicles are allowed, it is still the donkeys and their expert handlers who move absolutely everything. This morning we detected a rumbling and came face to face with a miniature rubbish truck, neatly tucked between uneven rocks, leaving no more than a few centimetres each side. 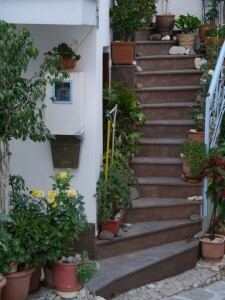 I deftly dragged my hound onto a slippery marble step and we waved a ‘Kalimera’ to the driver…who, in the usual way of professional Greek men, ignored us. Moving on….very slowly because the abundance of fragrant offerings at this hour are especially tempting to labradors…we encountered a glass door, where a flakily painted, bright blue wooden one would have been expected. Still, poised and wistful stood an English bull dog observing Kezzie’s every twitch and snuffle yet sadly unable to join her for morning sniffing. Grateful for our freedom we sauntered happily onwards, each with an expectation to be satisfied. Waterfalls of wonderful white jasmine, cascading from balconies, rocks and abandoned terraces should be unsurprising by now but each encounter elicits a gasp and much appreciative lifting of stems and appreciation of tiny blooms. Sometimes, as today, I cannot resist the temptation to scrump a couple for the saloon table. There are a few twists and bends which I deliberately weave into most expeditions…one, encountering a sudden change from whitewashed steps to bright blue, then blue everything…walls, containers , mats, woodwork. 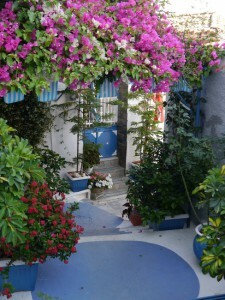 Two varieties ( one white, one purple) of bougainvillea have been trained across this narrow alley and every available nook and cranny effervesces with bright, flowering pot plants. Occasionally the owner will be attending to his paragons with snippers and feed or sitting comfortably on his step gossiping to neighbours. Another delight is the simple tub of acid yellow roses, just at the base of a spiral staircase. The fragrance is as sharp and piercing as the colour of the petals, ample reward for a steep climb to find it. There is one local corner which is now a sad reflection of life below a cheerful surface. Last autumn a group of enthusiastic workmen started to clear the debris from the courtyard of a little dwelling, in preparation for renovation. 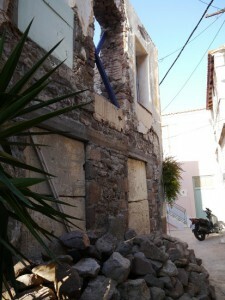 They laboured daily, carted rocks and soil and shored up doors and walls. The signs of an old village home to be restored for habitation looked good. Today, eagerly rounding the bend after passing a tiny chapel, I was met with a random barricade of wood and nails. No doubt betraying a typical story of optimism now on the shelf. Our friend Takis, who generously stores the dog freight box in his taverna back-room commented that Greece had her summer in January through to March this year and It’s now Winter. This morning’s sunshine suggests otherwise but, ‘We’ll see’ is the Greek response to most things these days.